Among other pitfalls, Blackwill anticipates “pockets” of “fifth column” Pashtuns in the north and west. In fact, as our map shows, Pashtuns are found in quite big swathes outside their southern heartland; to relocate them would require ethnic cleansing. Blackwill also assumes that resistance to the US is confined to Pashtuns, when all the evidence suggests that anti-Americanism is now widespread among all ethnic groups. The effect of partition would not be to isolate the most unstable parts of the country, but to unite Afghans of different backgrounds around the goal of re-unification. Partition is something that gets discussed from time-to-time. It's one of many policy options that's recycled every few years as a "new" idea. 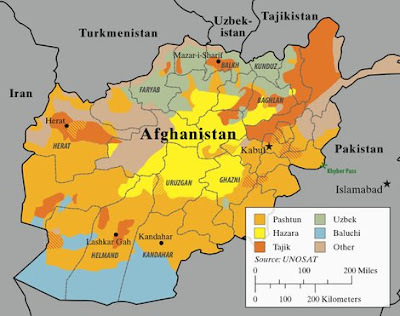 The problem, of course, is that most Afghans don't want the country partitioned and none of Afghanistan's neighbors want to see it happen either. Then there's the fact that "solutions" imposed from the outside have a long history of failure. It's Switzerland with turbans. What's the big deal?